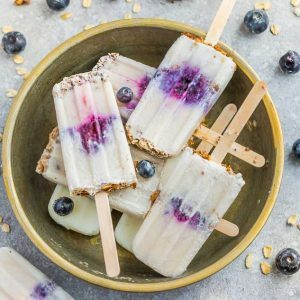 Blueberry Crumble Popsicles make the perfect easy frozen treat for summer. Best of all, made with only a few ingredients and packed with blueberries and coconut flavor. Vegan, Gluten Free and Dairy Free. Summer is in full swing here and I can’t think of anything better to cool down with than a creamy frozen treat. It also happens to be #popsicleweek! Every summer, Billy from Wit and Vinegar puts together popsicle week and there are hundreds of bloggers that participate sharing a different popsicle recipe. Last year, I shared these Strawberry Rhubarb Coconut Popsicles which turned out to be one of our favorites. I decided to stick with a fruity theme again and made these Blueberry Crumble Popsicles for this year’s contribution. These popsicles are a healthier treat or you can even enjoy them for breakfast. They’re refined sugar-free, dairy free and gluten free. The base is a creamy coconut milk mixed with some almond milk plus a little bit of maple syrup. You can also use any other liquid sweetener of your choice. The sweet blueberry compote can either be cooked down on the stove or simply puree it in your blender. Finally, some crunchy granola is sprinkled on for the crumble part. You can use your favorite store-bought brand or this recipe is my current favorite. Sprinkle a layer of granola into the bottom of your popsicle molds followed by almond or coconut milk. Place in the freezer for at least 30 minutes until firm then add the blueberry compote. Return to the freezer for another 20 minutes, then pour with more milk. Freeze for at least 2 hours until firm. 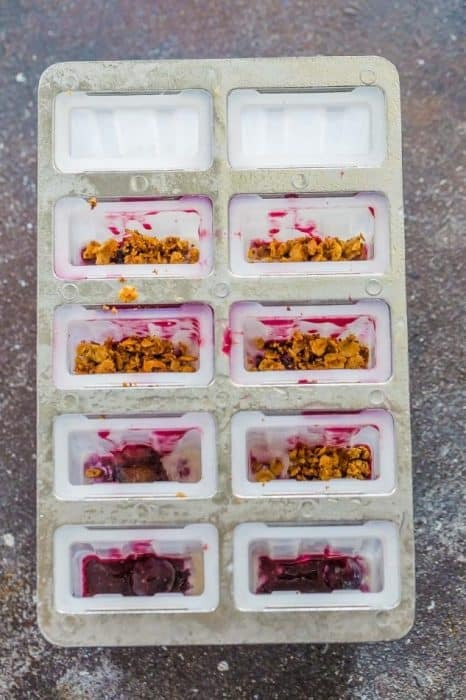 Add a thin layer of granola to the bottom of the popsicle molds. In a small bowl, whisk together 3 tablespoons maple syrup with 1 full can of coconut milk and just the cream from the other can of coconut milk. (You can discard or use the leftover liquid for something else). Fill popsicle molds with coconut mixture about halfway full and place them in the freezer for 30 minutes so the tops can set. While they are setting, make your blueberry layer. For the blueberry layer: In a small saucepan, combine blueberries and 2 tablespoons of maple syrup. Bring to a boil until liquid is syrupy and thick, mashing blueberries down. Remove from heat. (Alternatively - you can use your blender to puree the blueberries and maple syrup together). Once the tops have set, remove the molds and add a layer of blueberry mixture, then return the molds to the freezer for an additional 20 minutes until the tops have set. Finally, fill the molds with the coconut to the top, then sprinkle some more granola into the molds to finish them off. Beautiful! Coconut milk must have given these ice treats some extra creaminess and flavour. Awesome! These are beautiful, Kelly! Love the crumble and blueberries! It’s been so hot here and frozen treats are the perfect way to cool down! It’s been so hot here lately–these are the perfect way to cool down! And I love that they’re refined sugar-free :). Yum! Yay for summer pops! I love that these are a treat that’s full of wholesome ingredients, and I love the photo of your daughter holding it — so precious! These popsicles look beautiful! And healthy 🙂 Pinning to try them! These look amazing. I love love the crunch in these creamy popsicles, too yumm. Mmmm they look so creamy and delicious. These sound yummy! So pretty too. Thanks for sharing, Kelly! 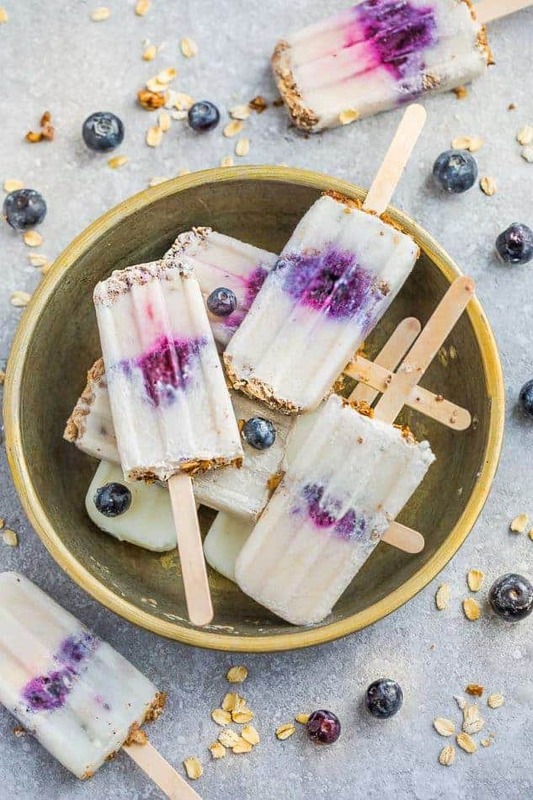 I blueberries, and these popsicles look so pretty and darn delicious, Kelly. Addition of coconut milk was a wonderful idea.